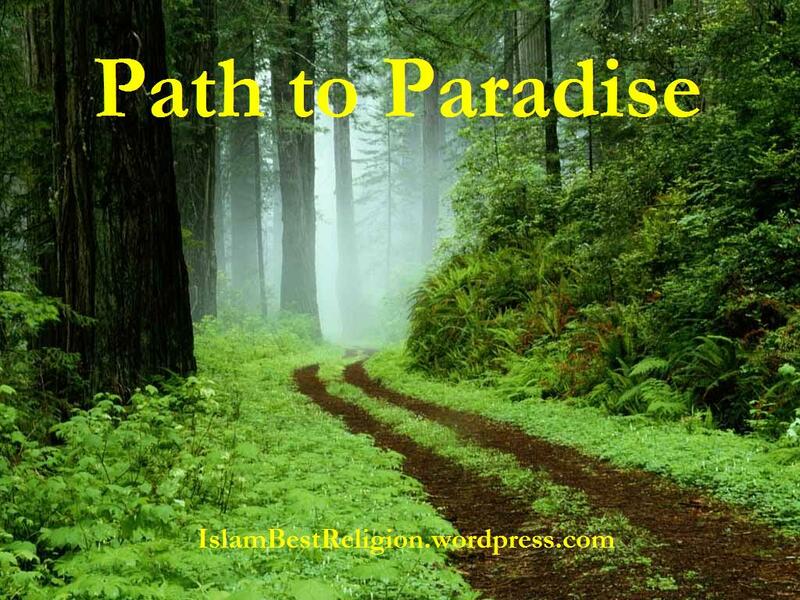 Every Friday afternoon, after the Juma prayers, the Imam and his eleven year old son would go out into their town and hand out “PATH TO PARADISE” and other Islamic literature. This particular and fortunate Friday afternoon, as the time came for the Imam and his son to go to the streets with their booklets, it was very cold outside, as well as pouring rain. And with that, he was off and out into the rain. This eleven year old boy walked the streets of the town going door to door and handing everybody he met in the street a pamphlet or a booklet. After two hours of walking in the rain, he was soaking, bone-chilled wet and down to his VERY LAST BOOKLET. He stopped on a corner and looked for someone to hand a booklet to, but the streets were totally deserted. Then he turned toward the first home he saw and started up the Side walk to the front door and rang the door bell. He rang the bell, but nobody answered.. Finally, he turned to leave, but something stopped him. Again, he turned to the door and rang the bell and knocked loudly on the door with his fist. He waited, something holding him there on the front porch! Next week on Friday afternoon after Juma prayers, the Imam was giving some lectures. As he concludes the lectures, he asked, ‘Does anybody have questions or want to say anything?’ Slowly, in the back row among the ladies, an elderly lady’s voice was heard over the speaker. ‘No one in this gathering knows me. I’ve never been here before. You see, before last Friday I was not a Muslim, and thought I could be. My husband died few years ago, leaving me totally alone in this world.. Last Friday, being a particularly cold and rainy day, I was contemplating suicide as I had no hope left. So I took a rope and a chair and ascended the stairway into the attic of my home.. I fastened the rope securely to a rafter in the roof then stood on the chair and fastened the other end of the rope around my neck. Standing on that chair, so lonely and broken- hearted. I was about to leap off, when suddenly the loud ringing of my doorbell downstairs startled me. I thought, I’ll wait a minute, and whoever it is will go away. I waited and waited, but the ringing doorbell seemed to get louder and more insistent, and then the person ringing also started knocking loudly…. I thought to myself again, ‘Who on earth could this be? Nobody ever rings my bell or comes to see me.’ I loosened the rope from my neck and started for the front door, all the while the bell rang louder and louder. Then he gave me this booklet, Path To Paradise that I now hold in my hand. As the little angel disappeared back out into the cold and rain, I closed my door and read slowly every word of this book. Then I went up to my attic to get my rope and chair. I wouldn’t be needing them anymore. You see? I am now a Happy Vicegerent of the One True God. There was not a dry eye in the mosque. The shouts of TAKBIR.. ALLAH AKBAR.. rented the air. Imam-Dad descended from the pulpit to the front row where the little angel was seated…. Blessed are your eyes for reading this message. Don’t let this message die, read it again and pass it to others. Heaven is for His people! Remember, God’s message CAN make the difference in the life of someone close to you. Q 5:3: This day I’ve perfected your religion for you, and completed my favor on you, and chose Islam for you as religion…. Please keep pray for all the needful and painful people in this planet and look after each other.